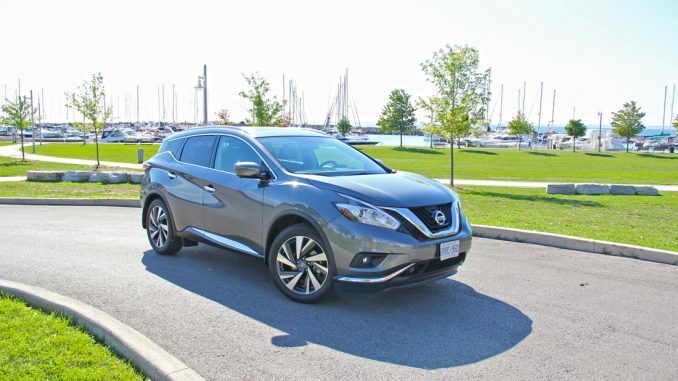 In this review, we take on the 2016 Nissan Murano. An elegant and versatile five-passenger midsize SUV it has plenty of room for all passengers. The new bodywork of the Murano brings a touch of concept car design to the street. With its bold exterior design and an interior that provides comfort for all passengers it was the perfect SUV to take my family and me on a road trip out to Kingston, Ontario recently. The front end is eye-catching, with its V-motion grill (a Nissan signature) and the boomerang-style headlights and taillights which are connected by the sculpted body lines that flow along the side of the crossover. The 3.5-litre V6 is smooth and delivers strong performance giving a very confident ride. During my time with the Murano I managed a fuel economy average of nine litres per 100 kilometres which was very impressive for a midsize crossover. The interior of the Murano was very quiet and comfortable up front as well as for rear seat passengers. The driver and front passenger both get heated and cooled seats, while the rear gets heated. The front and rear seats are what Nissan call, NASA-inspired “Zero Gravity” seats that help support a neutral posture. Nissan says they are aimed at reducing fatigue during longer drives. I found that they held up well during my road trip and heard no complaints from my passengers. A large C-pillar compromises some of the rearward visibility especially notable when checking blind spots. The only other complaint I heard from my passengers was the lack of cup holders. There are two in the front centre console; perfect for the driver and passenger. The rear cup holders are in the rear seat armrest, which if you are carrying 3 passengers in the back like I was, leaves no place for their coffee.